General information about the DOI system can be found here and here. A DOI name is a digital object identifier for any object of intellectual property. A DOI name provides a means of persistently identifying a piece of intellectual property on a digital network and associating it with related current data in a structured extensible way. DOI has been accepted as an ISO standard in 2010. If you have ever tried to follow an URL in an article older than 5-10 years, more often than not you will find that the URL is no longer active. The DOI system is an attempt to overcome this deficiency by providing stable and permanent references for intellectual property on the web. During the first half of 2009 MIC implemented the DOI system for every single article published in MIC during the period 1980-2008. The DOI prefix for MIC is 10.4173 and an individual article has been assigned a DOI on the following format: 10.4173/mic.year.no.paperno. For example, the first article published in MIC by Oddvar Hallingstad has the following DOI: 10.4173/mic.1980.1.1 and the following permanent URL http://dx.doi.org/10.4173/mic.1980.1.1. This permanent URL links back to the www.mic-journal.no website. If the MIC website is moved in the future, the DOI information will be updated to point to the new address. Another advantage of the DOI system, is the possibility to register all the references in an article in a structured manner. All the references made in MIC articles starting from 1980 have been submitted into the DOI system. The effect is an increased visibility of MIC articles, which again will lead to a wider audience. MIC also participates in the 'cited-by' system, which can be seen for this article. 'cited-by' shows which other papers have included the actual paper in the reference lists. The MIC class files for pdfLaTeX found in the Author Information have as of May 2009 new functionality for embedding DOI information in the PDF files. Prospective authors for future MIC articles will receive the DOI identification when the article is accepted. 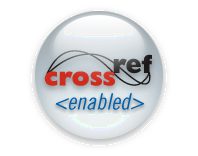 Authors are encouraged to embed the tag into the PDF file themselves using pdflatex prior to publication. Authors are also encouraged to embed DOI tags in their reference lists. [1.] Daniel Axehill and Anders Hansson (2012), 10.1007/978-1-4471-2265-4_14. Link to: MIC-2005-1-3 by: Bernt Lie, Marta D. Díez and Tor A. Hauge. [2.] S.E. Jordan and C.A. Brown (2006), 10.1016/j.wear.2005.12.011. Link to: MIC-2003-1-2 by: Dag A. Moldestad and Sveinung Løset. [3.] Avilash Sahoo, Santosha K. Dwivedy and P.S. Robi (2019), 10.1016/j.oceaneng.2019.04.011. Link to: MIC-2008-4-2 by: Morten Breivik, Vegard E. Hovstein and Thor I. Fossen. [4.] Peter L. Lee (1993), 10.1007/978-1-4471-2079-7_2. Link to: MIC-1988-3-3 by: Jens G. Balchen, Bernt Lie and Ingar Solberg. [5.] Peter L. Lee (1993), 10.1007/978-1-4471-2079-7_1. Link to: MIC-1988-3-3 by: Jens G. Balchen, Bernt Lie and Ingar Solberg. [6.] Gerhard Lappus (1987), 10.1007/978-94-009-3931-8_14. Link to: MIC-1980-1-3 by: Tørris Digernes. [7.] H. Hensel and R. Schnell (1984), 10.1007/978-3-642-70086-6_52. Link to: MIC-1980-4-2 by: Arne Tyssø. [8.] L. Nieto Degliuomini, D. Zumoffen and M. Basualdo (2012), 10.1007/978-1-84996-184-4_12. Link to: MIC-2000-4-2 by: Truls Larsson and Sigurd Skogestad. [9.] Potnpimon Chayratsami and Gregory L. Plett (2018), 10.1109/ICCSCE.2018.8685026. Link to: MIC-2015-3-1 by: Jon Åge Stakvik, Michael R.P. Ragazzon, Arnfinn A. Eielsen and Jan T. Gravdahl. [10.] Thomas McEvoy and Stephen Wolthusen (2011), 10.1007/978-3-642-24864-1_4. Link to: MIC-2000-4-2 by: Truls Larsson and Sigurd Skogestad. [11.] Subhashis Nandy, Joseph Prabhu J, Vishwanath Nagarajan and Om Prakash Sha (2019), 10.1007/s00773-019-00635-2. Link to: MIC-1980-3-1 by: Jens G. Balchen, Nils A. Jenssen, Eldar Mathisen and Steinar Sælid. [12.] Jianhua Bao, Daoliang Li, Xi Qiao and Thomas Rauschenbach (2019), 10.1016/j.inpa.2019.04.003. Link to: MIC-2004-4-2 by: Bjørn Jalving, Kenneth Gade, Kristian Svartveit, Are Willumsen and Robert Sørhagen. [13.] Jianhua Bao, Daoliang Li, Xi Qiao and Thomas Rauschenbach (2019), 10.1016/j.inpa.2019.04.003. Link to: MIC-2004-3-3 by: Bjørn Jalving, Kenneth Gade, Ove K. Hagen and Karsten Vestgård. [14.] Shuo Xie, Xiumin Chu, Chenguang Liu, Jialun Liu and Junmin Mou (2019), 10.1007/s00773-019-00639-y. Link to: MIC-1996-2-7 by: Thor I. Fossen, Svein I. Sagatun and Asgeir J. Sørensen. [15.] Nikola Bene , Lubo Brim, Jana Dra anová, Samuel Pastva and David afránek (2019), 10.1145/3302504.3311793. Link to: MIC-2011-2-3 by: Rafael Wisniewski and Christoffer Sloth. [16.] Kazem Sadegh-Zadeh (2012), 10.1007/978-94-007-2260-6_16. Link to: MIC-1994-3-9 by: Lotfi A. Zadeh. [17.] Kazem Sadegh-Zadeh (2012), 10.1007/978-94-007-2260-6_30. Link to: MIC-1994-3-9 by: Lotfi A. Zadeh. [18.] Jens G. Balchen (1994), 10.1007/978-94-011-0962-8_24. Link to: MIC-1982-2-1 by: Mark Reed and Jens G. Balchen. [19.] Taha B. M. J. Ouarda and Fahim Ashkar (1996), 10.1007/978-94-011-0395-4_10. Link to: MIC-1982-3-1 by: Anders Gjelsvik. [20.] D. E. Seborg (1999), 10.1007/978-1-4471-0853-5_4. Link to: MIC-1991-2-3 by: Jens G. Balchen. [21.] Jens G. Balchen (1998), 10.1007/978-94-011-5094-1_10. Link to: MIC-1993-3-5 by: Jens G. Balchen. [22.] D. E. Seborg (1999), 10.1007/978-1-4471-0853-5_4. Link to: MIC-1994-3-8 by: Dale E. Seborg. [23.] Søren Ketelsen, Damiano Padovani, Torben Andersen, Morten Ebbesen and Lasse Schmidt (2019), 10.3390/en12071293. Link to: MIC-2017-2-2 by: Daniel Hagen, Witold Pawlus, Morten K. Ebbesen and Torben Ole Andersen. [24.] Søren Ketelsen, Damiano Padovani, Torben Andersen, Morten Ebbesen and Lasse Schmidt (2019), 10.3390/en12071293. Link to: MIC-2018-2-3 by: Søren Ketelsen, Lasse Schmidt, Viktor Hristov Donkov and Torben Ole Andersen. [25.] G. Lappus and G. Schmidt (1990), 10.1007/978-94-009-0609-9_12. Link to: MIC-1980-1-3 by: Tørris Digernes. [26.] J. H. Hecq, L. Guglielmo, A. Goffart, G. Catalano and H. Goosse (2000), 10.1007/978-3-642-59607-0_29. Link to: MIC-1981-3-1 by: Dag Slagstad. [27.] J. Korstad, Y. Olsen and O. Vadstein (1989), 10.1007/978-94-009-0465-1_6. Link to: MIC-1987-1-7 by: Dag Slagstad, Y. Olsen and S. Tilseth. [28.] Ole G. N. Andersen (1989), 10.1007/978-1-4613-0677-1_6. Link to: MIC-1982-2-2 by: Dag Slagstad. [29.] Ole G. N. Andersen (1989), 10.1007/978-1-4613-0677-1_6. Link to: MIC-1984-3-1 by: Dag Slagstad. [30.] Karim Nassiri-Toussi and Wei Ren (1995), 10.1007/978-1-4419-8568-2_12. Link to: MIC-1993-4-1 by: Wei Wang and Rolf Henriksen.